Ever fearful that someone other than our Washington overlords might have some power and influence, the ever-creative Think Progress announced today a new series intended to demonize anyone who believes it makes sense for the federal government to own less land than 28 percent of America’s land area. 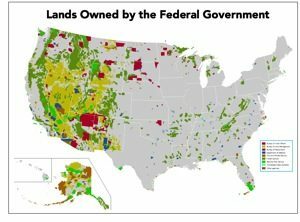 A premise behind its concern appears to be that only the federal government can manage land wisely: that government manages it better than private citizens and the feds manage land better than states or localities. Think Progress genuinely appears to believe that local and state governments are run by yokels who would pave over Yosemite, given half a chance (does that sounds like something Gov. Jerry Brown would do to you? ), and that if a private citizen owns something wonderful, he can be counted on to destroy it. If the feds are so great at land management, why does the National Park Service — manager of the lands we value most above all — have a $11.5 billion maintenance backlog? Don’t blame the recession: The maintenance backlog has been a serious problem for many years. One way to address the maintenance backlog would be to limit federal “ownership” of land only to that land with unique qualities — the lands the American people truly want preserved — and that land used for military purposes. The rest could be sold to the states in which they are found, to be managed by those closest to them, and with the greatest motivation to see that they are managed well. Some of those lands, in turn, could be sold by the states, giving the states and localities access to property tax revenue from private landowners. There is simply no reason for 81 percent of Nevada and 66.5 percent of Utah to be “owned” by the federal government. It’s also unfair that 93 percent of all federal land is owned in just 13 states. Why should Idaho (61.7% federal control) have substantially less control over its land than Kansas (.06% federal control) or Iowa (.03% federal control) or Nebraska (1.1% federal control)? Is Idaho really that different than Kansas, Iowa or Nebraska? And why is it fair for western states to have far, far less control over their lands than eastern states?